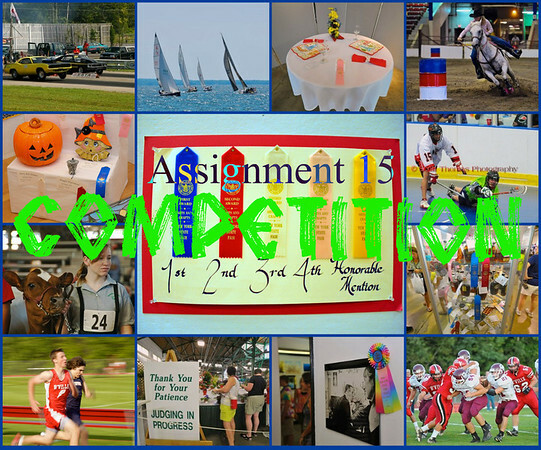 Assignment 15 is the conceptual topic of Competition. There are all kinds of competition in this world of ours. I photographed many types of competitions at the New York State Fair this year from art, photography, crafts, clothing, food, farm animals, wood working, talent, science and a slew of others. When I think of competition, I think of sporting events but there is also band, music, dance, games and eating. I am sure you could come up with more kinds of competitions. In fact, that is what I am asking you to do. Photograph a competition(s) of any kind and share them with us. As in the other assignments, do not send me your photos. What I would like you to do is post them on your blog, flickr, Google+ or other photo sharing site, personal website or any other place on the Internet where you can place a link to it here by making a comment to this blog entry. Then we can visit those sites and enjoy everyone’s Competition photos. Please, have your photos posted on or before Midnight (your time), Wednesday, September 28, 2011. Don’t have a place to post? Might be a good time to start up a blog or join a photo community like flickr. As I have done for all the Assignments, I’ll put together a recap with my comments. This entry was posted in Assignments and tagged barrel racing, challenge, competition, cow, drag racing, food, football, fun, horse, lacrosse, livestock, photo, running, sailing, track. Bookmark the permalink. Interesting and challenging topic, Scott! Glad you think so. Time to put all your photo knowledge to work and capture some great photos! Pets are people, too. Right? It’s a good time of year for community festivals and school sports. Thanks Scott, I took some at the apple festival that I might submit for the assignment. Going to link today so I don’t forget, but the post is actually scheduled for Wednesday morning. Hi Scott, this is my contribution. It’s a long post and I’ve enjoyed the photo opportunity. Ups – I was too fast here! – this is a reply to Kid’s Greased Pole Competition!